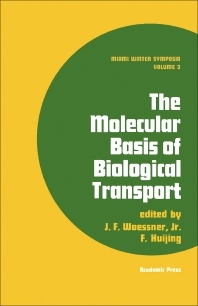 Miami Winter Symposia, Volume 3: The Molecular Basis of Biological Transport covers the proceedings of the symposium held in Miami on January 10-11, 1972. The book discusses the life of Feodor Lynen and his lecture on carbon dioxide fixation; the biochemical significance of the anion transporting systems of mitochondria, especially that of amino acid systems; and the possible functional roles of transport through membrane junctions. The text also describes the role of chlorotetracycline as a fluorescent chelate probe for monitoring Ca++ and Mg++ binding to biological membranes; and the effects of carcinogens and steroid hormones on the structural apparatus involved in protein synthesis and export. The nature and regulation of hexose uptake by Escherichia coli; the role of bacterial phosphotransferase system in sugar transport; and energy coupling to lactose transport in Escherichia coli are also considered. The book further tackles citrate transport by Bacillus subtilis; leucine transport in Escherichia coli; and the transport mechanism in isolated bacterial cytoplasmic membrane vesicles. Biochemists, microbiologists, pharmacologists, physiologists, and people involved in enzyme and metabolic research will find the book invaluable.